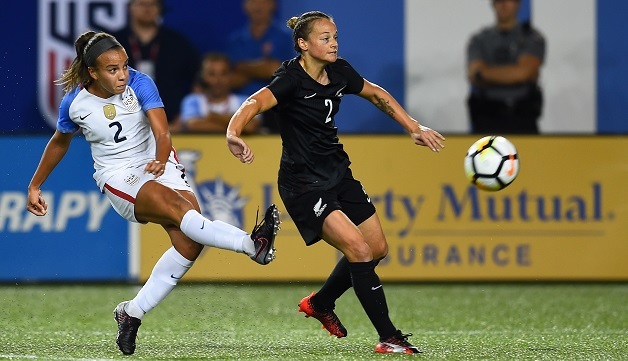 Boyds, MD (Sept. 20, 2017) – Washington Spirit forward Mallory Pugh recorded her sixth career international goal and 11th assist for the U.S. Women’s National Team in a 5-0 rout of New Zealand on Tuesday night in front of 30,596 fans at Nippert Stadium in Cincinnati. Pugh earned a spot in Jill Ellis‘ starting lineup once again and played 71 minutes as the U.S. completed a two-game sweep of New Zealand, which started on Friday night with a 3-1 win in Colorado. After the U.S. took a 1-0 lead in the 36th minute, Pugh pushed the advantage to 2-0 just before halftime with a short range, right-footed strike inside the near post following a full-speed run up the right wing and into the box. She received a pass from Lindsey Horan in stride on her way into the box and buried the shot for her second score of 2017. In the opening minutes of the second half, Pugh set up Alex Morgan‘s first of two goals on the night, sending a short cross into the box from the left wing, which deflected off a New Zealand defender and to the feet of Morgan, who beat New Zealand goalkeeper Erin Nayler with a quick shot just inside the left post.